View an inspiring commencement address from Dr. Rick Rigsby! GMA SHRM is excited to announce its 14th Annual Human Capital Conference will be held Tuesday, May 14, 2019 at the Alliant Energy Center in Madison, WI! In 2017, Dr. Rick Rigsby delivered one of the most passionate speeches ever heard. More than 200 MILLION PEOPLE worldwide viewed the speech in a video that went viral in just a matter of days. Dr. Rick’s dynamic presentations motivate, empower and inspire worldwide—from Australia, Africa and Asia, to the Americas, Europe and Canada. Rick’s audiences include Fortune 100 and Fortune 500 companies, academic communities, and service organizations. The internationally acclaimed speaker is a favorite among professional sports organizations, including the National Football League and the PGA. 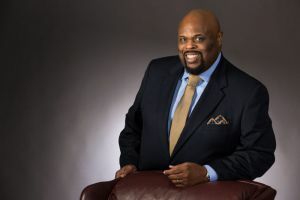 In addition, Dr. Rigsby is a regular contributor on various national media platforms, including the Fox Business Network. Named twice as an outstanding professor in the College of Liberal Arts at Texas A&M, Dr. Rick has numerous publications. His first non-academic book—Lessons from a Third Grade Dropout—is a USA TODAY, Wall Street Journal and Amazon best-seller. His latest book, Afraid to Hope is now available in markets worldwide. As is tradition, our day will conclude with a reception featuring appetizers, cash bar, networking, door prizes and silent auction to benefit the SHRM Foundation. Those that visit our sponsor booths will be entered in our drawing for our grand prize - a Sundara Overnight Package! Register now to receive the early bird registration rate of only $125! Please help us thank our conference sponsors who make this great event possible. If special accomodations are needed, please contact the chapter office. National SHRM Members - Register and Join GMA SHRM at the same time! Use this registration link and receive Conference Registration and 1 Year GMA SHRM Membership for $200 (National SHRM Members Only). Save $65 over non-member registration and new member dues! Conference has been submitted to SHRM and HRCI for pre-approval. For detailed session information, go to the Breakout Session Description page or click on a topic below. As is tradition, our day will conclude with a networking reception, raffle and silent auction to benefit the SHRM Foundation.